Hytale is an RPG, a creative sandbox and a platform for minigames. Nobody knows a game like a modder. It’s an intimate familiarity that’s different from the relationship developers have with their creations, born out of bending and breaking the game to fit new ideas. Hypixel Studios knows Minecraft very well. Simon Collins-Laflamme and Philippe Touchette founded Minecraft’s Hypixel Network in 2013, and it’s since gone on to be one of the game’s most popular servers. 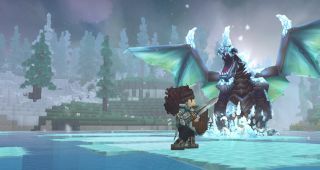 The studio has been founded on that success, and the 40-strong developer’s first game, Hytale, makes good use of all that Minecraft knowledge. Development on Hytale, Hypixel’s very own blocky sandbox, started in 2015, but even before then, there was a team of developers. Hypixel may have started out as two people, but it soon attracted more and more modders, and they kept adding to the server’s repertoire of minigames. “It wasn’t so much a matter as modders sticking together for a long time—this had become a company,” Content lead Sean McCafferty says. “It was game development, and with a very, very fast turnaround. One of our most popular games, SkyWars, was developed and put out in nine days. And it’s still the second most popular game on the network, with upwards of 4,000 people playing it at a time." The team contorted Minecraft, creating a diverse collection of game modes and maps that run the gamut from Murder Mystery, where a sneaky killer must take out a detective and several victims, to the aforementioned SkyWars, which pits players against each other on a map of floating islands. But Hypixel started to bump up against the limitations of the game. “There were restrictions left, right and centre,” McCafferty recalls. The team pushed against them, developing workarounds, but even when they weren’t insurmountable, it meant a lot more work for the modders. Hytale lets Hypixel escape those restrictions. Despite being blocky, Hytale eschews boxes. It’s a co-op fantasy RPG set in a procedurally-generated world full of different biomes, creatures and dungeons, both bespoke and random. It’s also a collection of minigames, many of them new versions of Hypixel classics. And it’s a sandbox where you can just build and create on your own world. The developer’s modding legacy is also very apparent, as players will be able to fiddle with in-game tools that let them create new minigames and assets. Self-expression is what he sees as the heart of both Minecraft and Hytale, but Hytale promises more ways to do that, whether it’s digging through the game’s scripts—without leaving the browser or client—and deconstructing them or turning an archer into a burly space marine. That’s why what is ostensibly a fantasy game will have projectile physics for modern weapons. We’re giving players the things we never had. The RPG serves as a foundation. It serves up exploration, building, crafting, combat and co-op, teaching players what Hytale’s about. McCafferty is adamant that it’s not just a taster, however. Hypixel is building a world with history, warring factions and structure. It’s a random world, but it’s still defined by a set of rules, determining the order of the zones, where villages and story dungeons will appear and the relationships between NPCs. Factions just go about their business, regardless of the player. Mostly they’ll stick to their own regions, but a hunter might venture into another land, maybe even into the village of another faction, potentially sparking a conflict. There’s a race of sentient tree folk who have a bit of a militant streak, represented by a special order of rangers, so they’ll try to chase guests off their lands with arrows notched. Hytale’s flexibility is hinted by the games Hypixel is already designing inside it, like a side-scrolling shmup and an isometric shooter inspired by Starship Troopers. It’s looking to update minigames like SkyWars, too. “Why not have a one-use jetpack?” McCafferty ponders. Unshackled from Minecraft, the developer can experiment with new camera controls and physics, which modders and players can mess around with in turn when it comes to creating their own worlds and minigames. Hytale doesn't have a release date yet, but keep an eye out for updates soon. For full disclosure, former PC Gamer staff member Chris Thursten is working with the Hytale devs on this one. He has become one with the blocks.